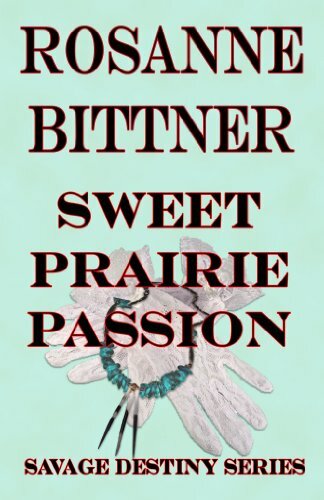 ﻿ Download/Read "Sweet Prairie Passion" by Rosanne Bittner for FREE! Bad poster 213 Another book cover desperately needed! Series : Book 1 of "Savage Destiny"
This first book in Rosanne Bittner's popular Savage Destiny series tells the powerful love story of 15-­year-­old Abigail Trent, who is traveling west with her family, and a very rugged plainsman, Zeke Monroe, the half-­Cheyenne guide who wins Abbie's heart as they journey through an untamed land beset with Indians, outlaws, and nature's harsh challenges. Although Zeke and Abbie come from very different worlds, violence and personal loss bring them together in unexpected ways, including a very poignant situation that involves Abbie's little brother. By journey's end, Abbie has changed from an innocent young girl to a strong woman whose courage and determination to survive make her the perfect woman for the sometimes violent Zeke, whose past and upbringing make him a challenge only Abbie's love and personal faith can overcome. Sweet Prairie Passion is the beginning of many more stories about this unforgettable couple and their life together as they face the perils of settling America's Old West and learn that love can conquer anything.